My Name is Abigail Brocwell and I am running for the 2017 Jr. Fair Princess and Royalty Court. I enjoy playing the ukulele and the piano. I also play the saxophone and keyboard in the Colonel Crawford Band. I am involved with my church youth group; Crawford Theatre Company, where I have been in 11 shows; band and choir, 4-H and Garden Tractor Pulling. I am a very creative and outgoing person who works well with others and is always up for a challenge. 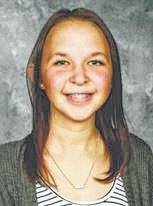 Sydnee Corwin is the 14-year-old daughter of Aaron and Jill Corwin. Sydnee is representing the Dairy Maids and Gents 4-H Club, where she currently serves as historian. She enjoys preparing and learning about her projects and the time she gets to spend with her livestock in preparation for the fair each year. Sydnee will be a freshman at River Valley High School in the fall where she is involved with Junior Teen Institute, Fellowship of Christian Athletes, volleyball, basketball and softball. Sydnee is a member of St. Paul’s Lutheran Church where she is actively involved in her youth group, bell choir and junior choir. I will try to summarize myself. I feel as if I am a well-rounded individual. I am hard-working, try to be involved in everything I possibly can, and I feel I have a good sense of humor. A lot of my time I spend helping my dad with horses and practicing in sports. When I’m not doing that I enjoy hanging out with my friends and just being a kid. I love to have fun and to always be doing something new and exciting. I am involved in local Girl Scout Troop 661. I help out at the safety town events that my friend Sarah brought back, and I’m also in my school science club. I have always been interested in science and animals and that is why I’m aspiring to be a veterinarian as my career, after high school. I feel as if this summarizes my fun-loving self. Hello, my name is Corin Feik, the daughter of Phillip and Michelle Feik. At 13-years-old, I am taking a beef feeder and a steer to the Crawford County Fair. 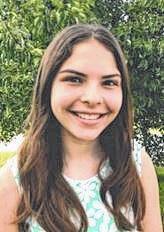 I am a member of the Liberty Leaders 4-H Club, the second largest club in the county, I have learned to work in large groups and with the diverse projects that 4-H has to offer. I am a proud student at William Crawford Intermediate School and take pride in my everyday work in and outside of school. I have concluded the seventh grade, on honor roll. I enjoy working with my cattle. Being in the 4-H program for five years, I have taken many different projects including: baking, lambs, steers and beef feeders. My favorite project is beef feeders because my family raises them. They can be difficult to train however. Their personalities help me realize how fun they are. I love showing them with my family the most because we all take a beef feeder to the fair. My favorite sport is basketball because my first coach was a big influence. He taught me fundamentals in a fun way. I hope this summary gives you a better understanding of why I love family, friends and fair. I am in the Heartland 4-H Club for Crawford County and have been for six years now including Cloverbuds. I have done many things at the fair like cooking projects, sewing projects, modeling, hogs, poultry, favorite foods, and now running for fair princess. Along with 4-H, I have went to 4-H camp all five years that I have been able to so fa. Through this I have many memories with some of my closest friends which I met at camp. Hello. My name is Jodie Jennings. I am the daughter of Virgil and Crystal Jennings. I will be a sophomore this fall at Wynford High School, where I am actively involved in FFA, Teen Institute, Student Council, and the Marching, Concert, and Pep Band. I am a 10-year member of the Mount Zion Buckeyes 4-H Club. I have held roles as the historian, reporter, safety officer, health officer, and the recreation leader. I have completed multiple Family and Consumer Science Projects, Department One Projects, Goats and Alpacas. I have also competed in the Speech Contest, Make it with Lard Contest, and several Senior Fair baking and photography contests. For the past two years, I have been a member of the Junior Fair Board. This year, I served as a 4-H camp counselor. Through 4-H, I have been given the opportunity to have wonderful leadership experiences and learn many great things while improving upon life skills. I have built friendships across the country because of the opportunities I have been given through this organization. Becoming a part of the Crawford County Junior Fair Royalty would further enrich my 4-H experience.